Is today’s coffee too strong to drink? Writer and veteran caffeine consumer Marnie Hanel investigates. Lately I feel as though I’m rolling the dice every time I order a coffee. Sometimes I drink it and I’m perfectly fine. Other times, the most seemingly innocuous cup will send me skyrocketing. Lest you think I’m a wimp, the other day I went to a single-origin tasting at the Portland, Oregon, headquarters of Stumptown, and the man behind the bar warned me against drinking the coffee. “This cup is not a cup,” he said, handing me a cup. Channeling Napa, perhaps, he revealed that this not-a-cup was a spittoon. “The goal of the tasting is to get as much information as possible before you get caffeinated out of your dome,” he said. That seemed strange since he’d only brewed enough coffee for each person in our group to consume a total of about one cup. Is today’s coffee too strong to actually drink? These days, coffee is better on every level than it was even a few years ago. But while the drink has changed, our coffee-consuming habits haven’t kept up. In the past, it was easy to identify a situation that could lead to over-caffeination: drinking cup after cup of thin, bitter coffee. But now it’s become easy to overlook the cues. Go slow, NPR listener, this is not your Woodstock doobie—could apply to coffee, too. “The purity is higher, the quality is higher, the standard of preparation is higher,” he says. But while the conversation around marijuana is all about the high, craft coffee makers are loath to speak about caffeine, much less to issue cautions. The emphasis now is on drawing out each bean’s particular flavor. “Specialty coffee has fought vigorously to get away from caffeine as a talking point,” says Michael Phillips, the director of training for Oakland, California–based Blue Bottle Coffee. “This is no longer just medicine to get us through the day. This is a delicious experience.” He suggests that inquiring about a coffee’s caffeine content is akin to asking if a craft cocktail will get you drunk. But while it may not be polite to talk about the effects of booze, you might still end up dancing on a table if you drink it. What few people know is that as roasters and baristas work to create more flavorful coffee, they’re making a product that can deliver an extra-powerful buzz. Among top-tier purveyors, light-roasting has become standard practice: Handling the beans delicately leaves the subtle flavors intact. The thinking is that a light roast showcases a coffee’s best, most refined qualities, while a dark roast covers up the defects of a so-so bean. 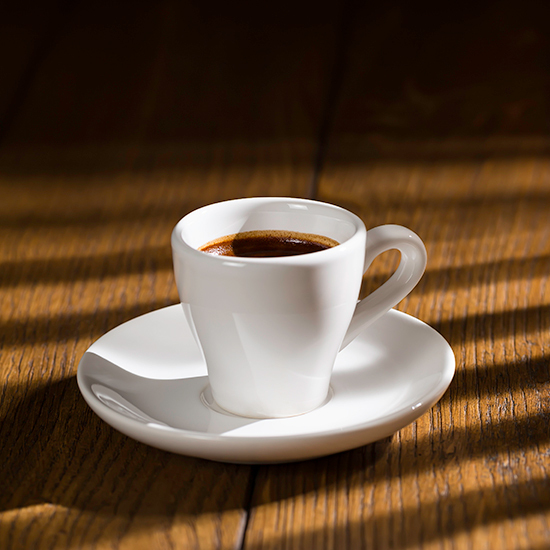 “The dark-roast coffee drinker often uses the vocabulary, ‘I like strong coffee’ or ‘I like bold coffee,’ which exists to me as something that’s very muddy and thick,” says Boston-based coffee guru George Howell. “The lighter roast permits nuance.” It’s counterintuitive, but these seekers of strength are looking in the wrong direction. Because the coffee bean is baked for less time, a light roast is denser—and, bean for bean, more caffeinated—than a dark one. In serious cafés like Coava or George Howell’s eponymous locations, this doesn’t matter much; baristas are measuring coffee grounds by weight, so it all equals out. But at home, where you’re groggily scooping your own, a light roast can result in a more caffeinated cup. Starbucks has played a large role in hooking the country on coffee by giving us more caffeine. They upped the brewing ratio, doubling the amount of coffee grounds per cup from the traditional one tablespoon to two, a standard that has trickled down to other coffee shops if not into home kitchens. Recently, though, Starbucks may have been bested at its own game. Companies like Stumptown and Blue Bottle started brewing coffee for hours instead of minutes, yielding the phenomenon that everybody is talking really, really fast about: cold brew. Although I’m not inclined to pick up a can of Red Bull, I’d never turn down a pint of Stumptown Chocolate Cold Brew, which contains more than four times the amount of caffeine as the energy drink. In the case of prepackaged coffee drinks, like those enticing Stumptown pints, a label announcing the caffeine content might help—just as it’s nice to be able to pick up a bottle of beer and know how much alcohol is in it—but even that doesn’t touch the larger mystery. Unless it’s brewed by an automated machine, the caffeine content in the average cup of coffee is only going to be as consistent as the person making it. The takeaway, for me at least, is that I’m not insane for being variously affected by coffee, which is itself so varying. It’s no wonder so many people feel a little uneasy about drinking something that produces such an unpredictable effect. What’s puzzling, though, is that it could be better managed—it just isn’t. Glen Fox, an Australian scientist, has developed a way to sort beans by caffeine content, envisioning it as a means for high-end coffee makers to implement quality control. So far, he says, no one has taken him up on it. Maybe people don’t want to know what’s in their coffee because they fear the results. I know I don’t. As a caffeine enthusiast, I feel guilty. I have coffee shame. But is that even necessary? When I was pregnant, I was offered, without compunction, raw cheese and wine, sushi and steak tartare, but never coffee. When I ordered it, baristas often volunteered the tea list instead while my fellow patrons looked askance. And so, even though I’d determined drinking it was safe, I noticed myself cutting back. I’d make myself a cup in the morning, then find it on my desk in the evening, barely touched, as though my desire for coffee was not so much about enjoying it as having it around, like a cat. Once my son was born, it didn’t take me long to disabuse myself of the notion that coffee was a Zen habit. I live in Portland—they serve Stumptown at the hospital. The strangest thing about our tormented relationship with coffee is that it’s probably good for us. Countless recent studies extol its health benefits, crediting it with lowering one’s risk of stroke, heart failure and cancer, and improving one’s memory and warding off tinnitus. The latest federal guidelines say drinking three to five cups a day can be a healthy habit. Coava’s Higgins woke up one day and realized he’d been drinking coffee every single day for the past 12 years. He decided to see what would happen if he stopped. “At first I thought, This ain’t so bad,” he recalled recently, sitting among dozens of tiny coffee trees he’d potted tenderly for his office. “I made it until the fifth day. I was on a road trip, which was conducive to my efforts because I didn’t have a way to brew.” Bewildered and a little weepy, the direct-trade purist did the unthinkable. He pulled into a Jack in the Box, ordered a cup of coffee, and chugged it. He felt better right away. Even more so when he peeked into the condiments cabinet and found a submicron water-filtration system hooked to the brewer. When even the worst coffee is this good, why would anyone ever want to live without it? Marnie Hanel is a Portland, Oregon-based writer. Her work has been featured in the New York Times Magazine, among other places.